InsiteIG offers a wide variety of Suspended Solids monitoring devices. Everything from portable suspended solids meters to on-line transmitters and instruments that can handle up to 16 sensors. 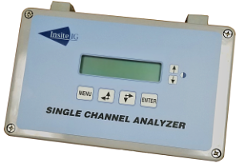 With over 15 years experience manufacturing Suspended Solids meters and controllers, InsiteIG has a proven record of supplying reliable, cost effective suspended solids instrumentation to water quality professionals. - Self cleaning is available for all continuous suspended solids sensors. Contact InsiteIG or your Local Representative for answers to your questions.